Please welcome Silvia Moreno-Garcia to the blog! 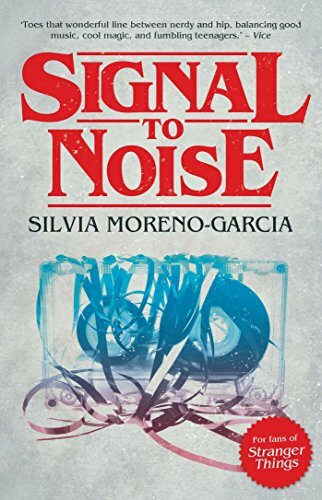 Her fantastic debut novel, Signal to Noise, will be out next week, and she kindly stopped by to answer a few questions about the book, and more! I adored Signal to Noise, and frankly, didn’t want it to end. I also may have cried at the end (but in a good way.) What inspired you to write it? I wanted to write something about music and records. My parents both worked in radio and I grew up in radio cabins and watching tape reels turning. The analog format will soon be completely foreign to the younger generation who might regard the artifacts as something almost alien and maybe even magical. My son does own a portable record player but he is an exceptionally weird child. Are Meche, Sebastian, and Daniela inspired by real people? I say that all my stories are autobiographical, which in a sense is true. My friends from high school vaguely inspired the characters, though I doubt they’d be able to recognize themselves and the final result is a composite of a number of people – my friend Ana had a chronic illness but she was a sassy girl who liked to throw parties – and pure imagination, with pure imagination carrying the bulk of it. I think mostly, if I want to be accurate, real people evoked a feeling which I used in the book. Music is a huge part of the book. Did you actually listen to music while writing it, and if so, what were a few songs on your playlist? I listened to a lot of music. Mostly stuff from the 80s. Mexico City in 1988 was almost a character in itself. What makes it such a magical place for you? There’s a comic strip in Latin America called Mafalda and at one point a character describes something (some kind of kitsch decoration, I think) as “horripirmosisimo” which if I tried to translate it would be horriautiful. Something smack between horror and beauty, perhaps what certain philosophers might term sublime. Mexico City is a weird, weird place. On the one hand there are all these beautiful old buildings downtown, and then you had these hideous brutalist buildings that some monster built in the 70s. So I think that growing up I alternated between despair and awe. You’ve got to be in awe of the city. It’s like a snake biting its tail, sculpted in concrete. In addition to Signal to Noise, you have numerous short stories under your belt, and are the publisher of Innsmouth Free Press, a Canadian micro-publisher (horror and dark spec. fiction), but have you always wanted to be a writer? Will you tell us more about yourself and your background? I wrote since I was a kid but what I wrote was crap. I didn’t seriously start writing anything readable or pursuing publication until nine years ago when I managed to place a couple of stories in magazines. I don’t have any formal fiction writing training and English is my second language. When I started writing seriously I was at a low point because I had just had a baby and we were barely able to make ends meet, even with my husband working two jobs. I couldn’t find any work. I was very frustrated and so I wrote something called “King of Sand and Stormy Seas” and that’s really when I started becoming a writer. The stuff before was fluff and ridiculous crap. What authors or novels have inspired you the most, in your writing, and your life? It’s very hard to tell. I really like Nabokov and I admire him because English is not his first language, but I don’t kid myself that I am anywhere near him in terms of building a sentence. Lovecraft has made a weirdly long appearance in my life. I’ve read a great deal of what Tanith Lee has published, at least in novel format. Probably Poe’s and Bradbury’s collected stories in my early teens. 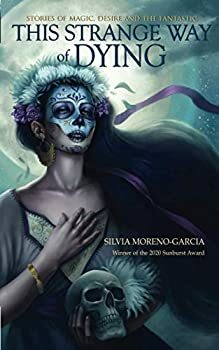 Also a collection called Mirror of Lida Sal: Tales Based on Mayan Myths and Guatemalan Legends. I went through cycles. I had a big Truman Capote phase and I had a Lovecraft phase and I had a Latin American poetry phase. I like to re-read certain things so I don’t think this applies for me. Maybe Where the Wild Things Are. I never saw that until I left Mexico and I was fascinated by the monsters, even though by the time I found the book in a bookstore I was an adult. I associate it with my children, so of course I’d like to go back to the beginning and read it to them again. Um…(eyes book next to her)…an academic book about biology and human nature. If you mean fiction I am starting to read the first three James Bond novels for fun and profit. Hopefully this book does well and I can sell my next one and dive into a big pile of money like a certain capitalist duck. interview, Signal to Noise, Silvia Moreno Garcia.